Anything ombre is a fan favorite these days! 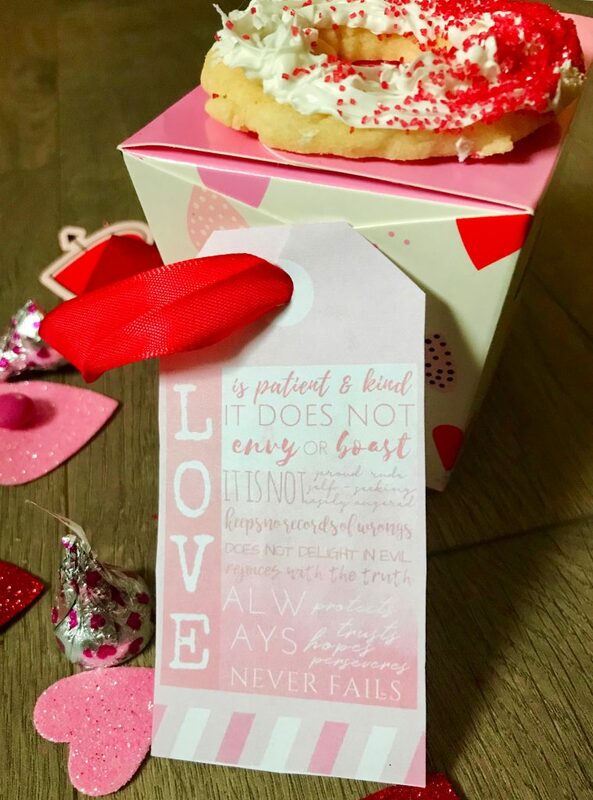 For a trendy sweet Valentine’s Day treat, try these Ombre LOVE Sugar Cookies – with a free printable ombre “Love is Patient & Kind” gift tag to match! I had a career teaching high school for 15 years before I became a SAHM to my twin boys, so I’m something of a late bloomer when it comes to all things homey and Martha Stewart. 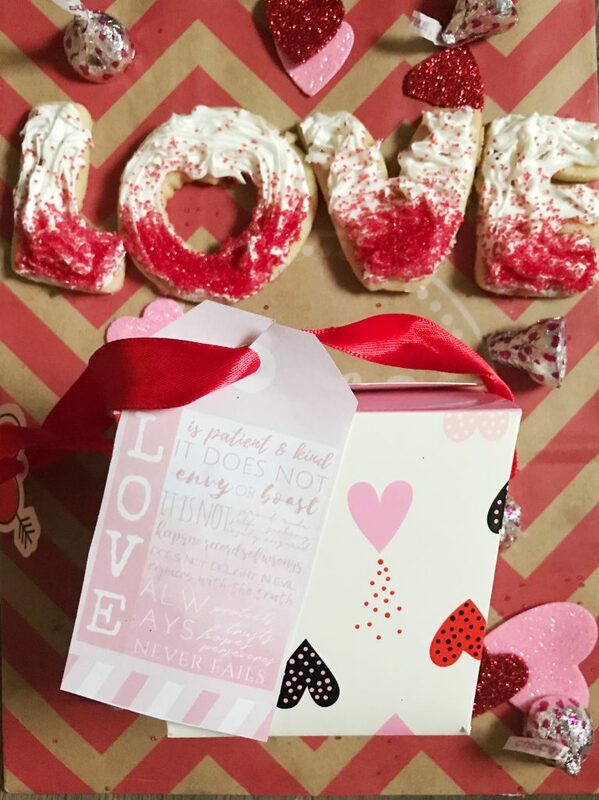 Well, even she had to start somewhere, So for all of you non-Suzy-Homemakers, Lazy Janes, Late-to-the-Gamers or if you’re just short on time and/or creativity, here’s a Valentine’s Day treat project that is quick and easy. 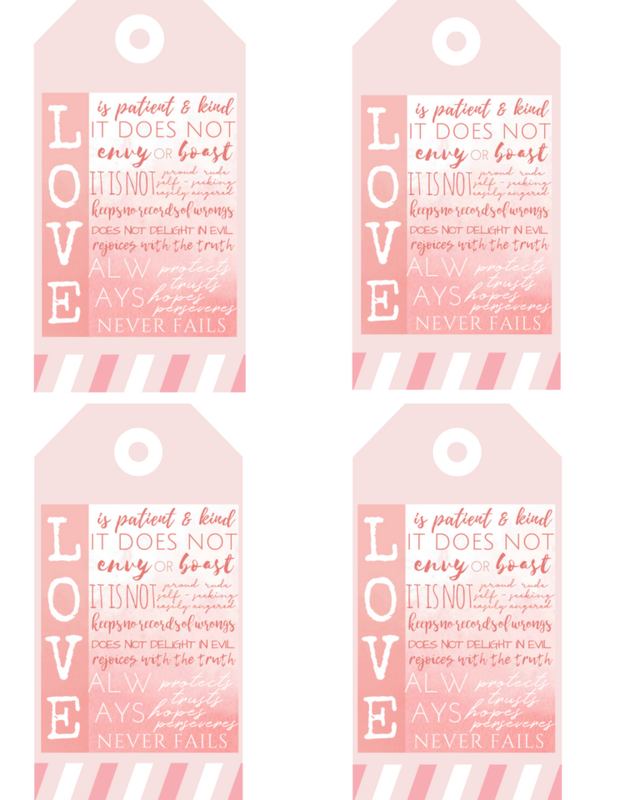 Earlier this week, I posted Love is Patient, Love is Kind Free Printable Wall Art, and when I was putting them together, I thought that the pink ombre design would be super-cute as gift tags or Valentine’s Day cards. I wanted to make a treat to go along with it, and as I’m not the ultra-creative-baker-type, I thought ombre cookies with sprinkles would be easy enough but have a pretty nice effect! 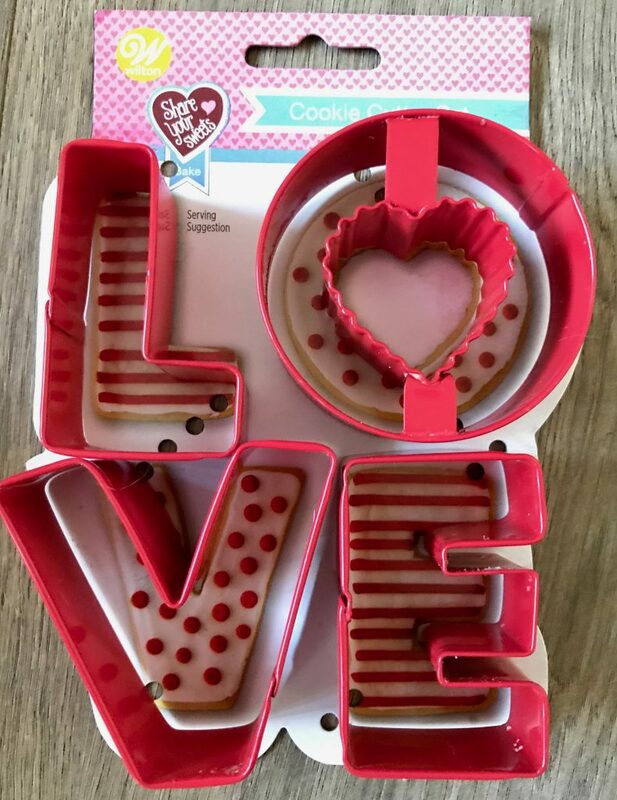 I found these Wilton LOVE cookie cutters at Target, but this treat would work with any kind of cookie cutter you wanted to use, even just a circle made with a glass. I used a store-bought bag of sugar cookie mix, but you can use your favorite from-scratch recipe. The Wilton cookie cutters had a recipe on the back, but me being me, I just took the short-cut. If you are looking for a great sugar cookie recipe, you can use this one from I Heart Naptime. Once the cookies are baked as per the instructions and then iced (I used Betty Crocker Spray Cupcake Icing ), you take pink or red crystal sugar sprinkles and lightly sprinkle the cookie, applying more heavily as you get to the bottom to achieve that ombre look. You can pour some in your hand and sprinkle them out, or you can keep them in the container. Go with whichever way you feel like you have the most control over how much comes out. Be sure to apply the sprinkles before the icing sets. As with hair, the type of ombre you want is up to you! Give the cookies a good overnight period to let the icing dry so they don’t stick together once you pack them up. I bought these cute retro Valentine’s Chinese boxes from Target for the cookies , but you can use any treat bag you like. There are adorable ones you can get at Walmart or even Dollar Tree. 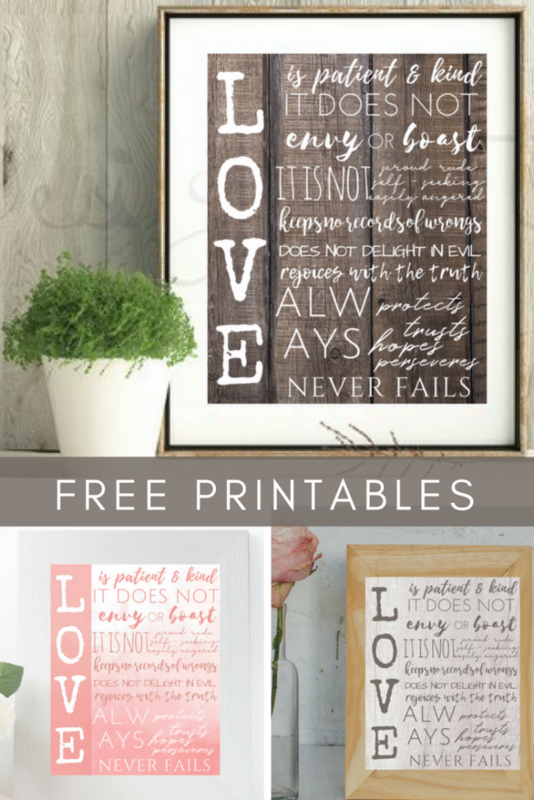 If you would like the wall art to go along with it, you can print out Love is Patient, Love is Kind in pink ombre or 2 other designs! I made these treats during my Whole30 round, which clearly isn’t the smartest choice in the world. But thankfully, I have neighbors with super-cute daughters, and I always make my treats with them in mind. It’s more fun when I know the goodies are for people we really love and care about in real life. 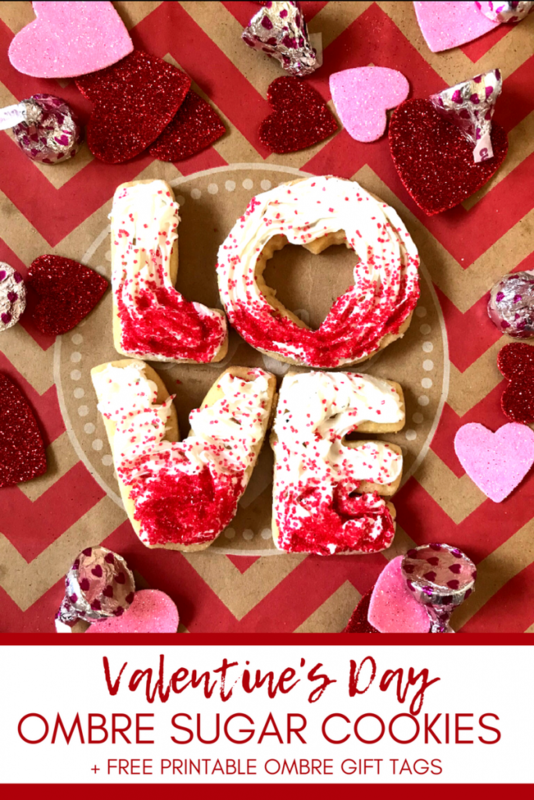 If you want to try some other easy and fun treats, check out these XO Hugs and Kisses Valentine’s Day Treats – cookie bars, brownies, and cupcakes – along with a free printable tic tac toe board! Happy Valentine’s Day, friends! Any fun things you do with your kids or family? I’d love to hear about it! I just saw those love cookie cutters at Target this week. I bought the 4 different sized heart cookies cutters. My girls and I are baking heart sugar cookies this weekend. Cookie dough is made. I just have to bake and decorate. 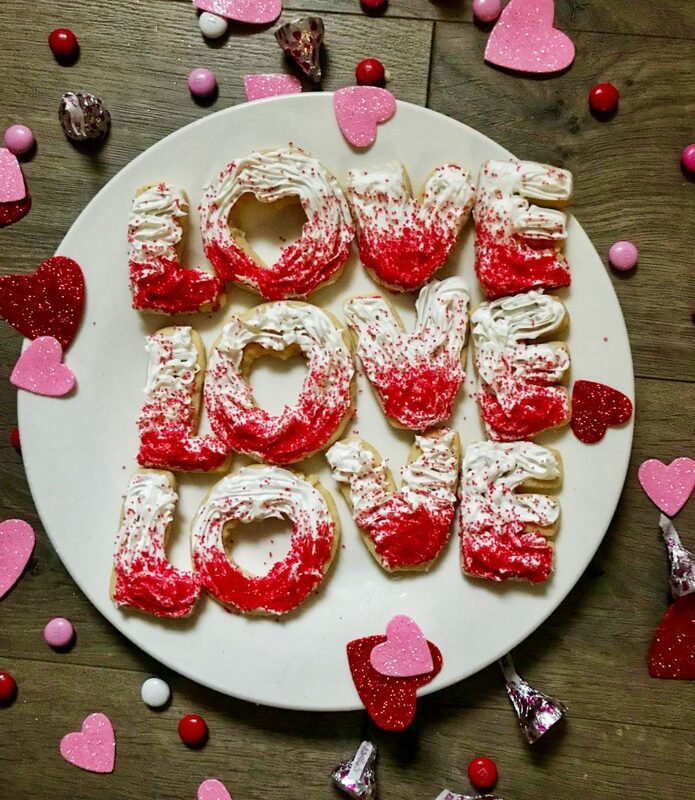 Your love cookies look great! The ombre look is a perfect idea. How fun! My boys helped, but I spend most of the time getting one of the to turn his face away when he was coughing! Ugh! I hope you had a great weekend baking with the girls. The best, isn't it?! It was lots of fun. I didn't get as much done that weekend, but my main goal was to have fun with my girls and bake.